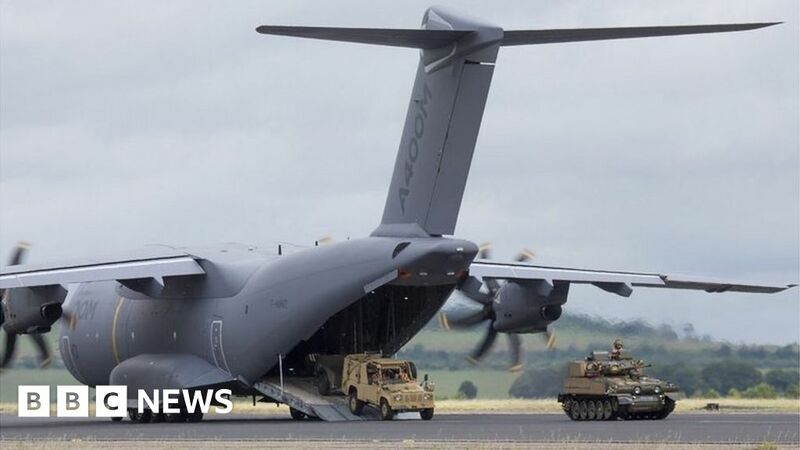 Airbus has written off another €1.3bn (£1.2bn) on its troubled A400M military transport plane, bringing total losses on the project to more than €8bn. The A400M has had setbacks over the years, most seriously a crash during a test flight in Spain in 2015 which led to the deaths of the four crew members. The aerospace group reported better-than-expected 2017 profits of €4.3bn, against €3.9bn in 2016. Shares in the company were up 9.8% by Thursday’s close. Revenues were “stable” at €66.8bn, up from €66.6bn. In its statement, Airbus said higher aircraft deliveries had been “offset by a reduction in revenues of around €2bn from the perimeter changes”. Last week, Airbus reached a provisional agreement with seven European NATO buyer countries over further delays in deliveries for the A400M. Airbus said it expected to deliver about 800 commercial aircraft in 2018 if engine manufacturers met their commitments. If it does hit those delivery targets, it said it would see profits increase by about 20% this year. The company said it had “continued the production ramp-up” of the A320neo commercial plane – an upgraded version of the medium-haul A320 jet with more fuel-efficient engines. It “finally delivered” a record 181 aircraft last year “despite persistent engine issues”, said Mr Enders. The “engine issues” include delays in supplies from Pratt & Whitney and CFM International. “The A320neo ramp-up remains challenging and requires that the engine suppliers deliver in line with commitments,” Airbus said. Last month, the Middle Eastern airline Emirates announced an order for up to 36 Airbus A380s. The $16bn (£11.5bn) deal amounted to a reprieve for the A380 after Airbus threatened to stop making the jet unless it could strike a deal with Emirates. In its results statement, Airbus said Emirates Airline’s latest order provided “increased visibility on the A380 programme for the years to come”. The A400M was meant to be the flagship of Airbus’ military fleet – but the programme has been dogged by seemingly endless delays, technical problems and what the chief executive, Tom Enders, has described as a ‘flawed contractual set-up”. As a result, the heavy-lifter has ended up being a financial deadweight on the company. The new write-off of €1.3bn takes the total so far to more than €8bn. That isn’t the only issue causing concern. The company is the subject of ongoing corruption investigations in both the UK and France, over its use of intermediaries in major aircraft deals; it now seems the US authorities are taking an interest as well. With the chief operating officer, Fabrice Bregier, stepping down and the top salesman, John Leahy, retiring, the company is already in a state of management flux – and Tom Enders is also due to leave next year. But, on the plus side, Airbus’s order book is still full to bursting. It has even managed to log a new order for the troubled A380 superjumbo, enough to keep the production line going for another decade. And profits are rising. So it isn’t all bad news – far from it.